Today I want to discuss perhaps the most interesting phenomenon of Newtonian mechanics, the gyroscope. This isn't going to make any sense if you've never encountered a gyroscope before - so if this is the case, please run right out to a toy store and get yourself one! Trust me, you won't regret it. The main phenomenon to be explained is this: a spinning gyroscope won't fall down. Instead of falling down, it pirouettes like a ballerina around the vertical axis, a motion known as "precession" (see Fig. A). The spinning of the gyroscope's disk is critical: a non-spinning gyroscope falls right down to the ground, just like any other object. Somehow, the spinning gyroscope is able to deflect the downward force of gravity into a sideways force, causing the gyroscope to precess rather than fall. How does it do this? The standard explanation invokes the mysterious concepts of "torque" and "angular momentum", which are nowhere to be found in Newton's laws. As I explained in my first post, I prefer to avoid these secondary concepts and work directly with Newton's fundamental laws. In other words, I want to understand what's going on in terms of plain old forces, part A pushing on part B and part B pushing back. That is Newtonian physics in a nutshell, and don't let anyone tell you different! The first thing to realize is that the disk is not indivisible. It is made of things(atoms) which hold together by exerting forces on each other (atomic bonds). The bonds are very strong, hence the disk is quite rigid - but it is not entirely rigid. When a force is applied to, say, one side of the disk, the disk will flex a little bit. The flex means that the atomic bonds are bent slightly, and that is how the force is transmitted to the rest of the disk, so that the whole disk moves, rather than just the side which had the force applied. Now let's take our rubber-disk gyroscope, spin the disk up to a high speed, and place it on its pedestal (Fig. A). What forces are at work inside the disk as gravity tries to tip it down to the ground? Focus first on the left and right edges of the disk (Fig. A). At any given moment, these parts are moving at some angle to the ground, and not parallel to it. As the gyroscope starts to tip further, the angle of motion of these parts also tilts; however, due to inertia, these parts don't want to change their angle of motion. They want to keep moving the direction they already were, and for our flexible disk we see that this will cause the disk to flex. The disk as a whole tips down a bit, but the left and right edges drag their heels and try keep their previous direction of motion. The side which is attempting to change its motion in the "outward" direction (the red arrow in Fig. A) will flex inwards (towards the base), and the other side will flex outwards. The flexes are just the visible manifestation of the forces which have to be exerted from the body of the disk to the edges to make the edge parts change their direction of motion. But for every force there is an equal and opposite reaction (Newton's third law); in other words, the edges of the disk exert force on the body of the disk as well. The effect of these reaction forces is simple to see. It is exactly the same as if the flexes had been caused by physically grabbing the edges of the disk and twisting it, pulling the blue arrow out and pushing the red arrow in. This is the twisting force which makes the gyroscope turn (precess). In the real case of a "rigid" disk the forces are the same, and the flexes are present too, but they are just too small to see. So the gyroscope starts to tip over, the twisting force kicks in, and the gyroscope starts to precess around the vertical axis. Two questions remain: why does not keep tipping over; and, why does it keep on precessing after it stops tipping over? For the first question, why the gyro doesn't tip over, the reason is that the precession affects the top and bottom edges of the disk just as the tipping affected the left and right edges (Fig. B). Precession makes the top and bottom edges change their direction of motion from moment to moment, and they resist this change. For a flexible disk we would see the top edge straining inwards as the bottom edge flares outwards, and again the effect is to twist the gyroscope, this time about a horizontal axis, pressing the base of the gyroscope against its support and counteracting the downward force of gravity. This is why the gyroscope doesn't fall. Lastly, if the precession came as a reaction to starting to tip over, what keeps it going when the gyro is no longer tipping any further? After all there is always friction, which will inevitably slow the precession unless there is an ongoing twisting force. The answer is that the gyroscope does not stop tipping. It droops slowly but steadily lower, producing a constant twisting force which counteracts friction. The more friction there is, the faster the drooping (note that this is friction with the base, not friction of the rotating disk itself). In terms of energy, the gyroscope's gravitational energy (i.e., its height above the ground) is gradually dissipated away into heat energy, through the friction with the base. Of course the rotating disk also has friction, and will slow and stop eventually. However, this isn't what causes the gyro to droop - although it affects the rates of both precession and drooping. Sorry, but I find this explanation confusing. Start by imagining two single point masses held equidistant from a central shaft of no mass. Now imagine these two masses rotating about that shaft. This is a pretty simple model of a gyroscope. Imagine that we wish to move the two masses parallel to the shaft. We apply a force in that direction and everything moves as expected. Imagine next that we wish to translate the two masses in the plane they describe with the shaft. Same thing. And the same for uniform motion in the third direction. Superposition applies to such linear models, so our intuition works well in understanding the results. Next, we try rotating shaft of the spinning gyroscope in a direction that reorients it in space The problem here is that the motion we are imparting is not rectilinear. And if one tries to understand it without some understanding of the models that govern non-rectilinear motion one ends up with nonsense. Intuitively, one must grasp that there is a kind of rotational inertia (technically it's rotational momentum) that is related to the radius of curvature and the instantaneous velocity of the particle. And that reorienting the shaft necessarily involves changing that rotational momentum because the momentum has both a magnitude and a defined direction. Tiny forces can make slow changes to the rotational momentum of the gyroscope. And, in fact, precession is a consequence of the force of gravity on a gyroscope whose poles are not aligned with the gravitational field. Precession is a motion that arises as a result of a gravitational turning moment applied to the shaft of the gyroscope. One might observe that the shaft tends to rotate in space perpendicularly to the direction of the force one applies to it. One can write the equations. One can get used to the phenomenon; but until one has solved a lot of such problems it is always counterintuitive. It's not clear to me that one can say much more without resorting to writing equations. I am a CFI ( Certified flight instructor) student and have been searching for an intuitive way of explaning how and why a gyroscope precess and your explanation seems to offer the easiest way in understanding the mechanics of a gyroscope without resorting to the angular momentum and vectors etc. However some of the comments seem to have make the whole thing a bit confusing; for example, when you talk about figure A, I have not been able to understand how the flexes and directions of movement ( inward, outward, left and right) are directed. Does "inward" mean moving towards the paper from me and "outward" towards me from the paper? "The side which is attempting to change its motion in the "outward" direction ( the right hand side in Fig. A) will flex inwards." What way is the "outward" directed and what part is the right hand part? @Sung: You're right, my directions are confusing! When I say right/left, I am imagining looking at the gyroscope from the front, i.e. from the side opposite from the base. @Steve: It is a misconception that one needs special concepts to understand motion. Those concepts are useful for calculation, but they get in the way of actual understanding. Check out Newton's 3 laws - the laws which govern all mechanics. They do not mention angular momentum or torque; therefore, the true explanation of the phenomena does not depend on angular momentum or torque. Sorry, and when I say "outward", I also mean "away from the base". Thank you very much for the most easiest and intuitive explanation. I will have other pilots see this post. Your description of how the force of gravity on different points on the rim of the gyroscope causes movement perpendicular to gravity and the initial axis of rotation is unclear to me. Can you provide a Newtonian description of all the total forces, their sum and net force, for each point on the gyroscope? I am looking for a description that can be used to show the net force on the gyroscope as a whole at each particular point in time, from the initial setup (no precession), to the acceleration increasing the rate of precession, to its final state of equilibrium. Yes, a qualitative understanding of the force diagram was my aim in this posting. To draw the full force diagram is too complicated because the gyroscope is a rigid body with many internal forces. But for starting the precession, the important forces are which go from the gyroscope body to the moving masses on the sides of the gyroscope, and from those masses back to the rest of the gyroscope, as I indicated on the figure. These backreaction forces (Newton's third law) are what turn the gyroscope. Or more precisely, they cause its base to exert force on the ground, and the backreaction force from the ground turns it. I found your post extremely informative.But I couldn't understand your explanation of dampening of gyroscope.I friction doesn't cause,what does? Definitely, it is friction that damps the gyroscope. Both the friction of the rotating disk, and the friction of the base against its support, which will rub as it precesses around. Figure 1: The particle under the red arrow (r) has an absolute speed relative to the ground smaller than that of the particle under the blue arrow (b). Therefore the vertical components of the speeds of r and b are different. Because the trajectories of r and b caused by the gyroscope's fall towards the right are within vertical parallel planes, the moments they exert upon the vertical axis are different. 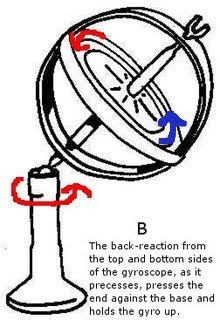 As a result b pulls the disc to the right stronger than r and the gyroscope rotates as shown. Does this explanation make more sense, because the explanation in the article is not convincing. Figure A: the particle under the red arrow (r) has an absolute speed relative to the ground smaller than the particle under the blue arrow (b). because of physical constraints, the two particles are rotated by the gyroscope's fall to the right within vertical parallel planes. 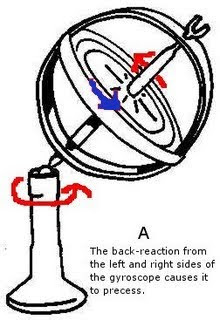 as a result, the centripetal force caused by the fall to the right which acts upon r is smaller than the one which acts upon b. as a result, the gyroscope moves as shown. Figure B: because of the rotation of the gyroscope explained in Figure A, r moves slower than b and the moment relative to the horizontal axis prevents the gyroscope from falling. Good explanation. Possible to add the equation balancing the precision & tipping torque?